While we’re still waiting with the most powerful bated breath in this solar system to see whether CBS will renew Supergirl or not, the upcoming fall season will definitely have at least one new DC Comics-born TV show on the schedule. But it won’t be a drama, neither broody nor lighthearted, as NBC has officially put in a series order for the hero-filled workplace comedy Powerless. The perfect chaser to Netflix’s upcoming Punisher series? We’ll see. With the series order announcement came the first looks at the comedy, and as you can see above, that is most certainly the unlikely pairing of Firefly vet Alan Tudyk and former Disney Channel star Vanessa Hudgens. Hudgens stars as Emily Locke, a claims adjuster who works at what is probably the worst insurance company ever, in a world where superheroes are causing a lot of damage. But she gets to help people, so she is able to put up with Tudyk’s turd of a new boss, Del, whose nepotistic promotion has gone straight to his snobby and power-mad head. The new show will also star Danny Pudi as Emily’s best friend Teddy, who spends his work days just trying to find ways to make their occupational environment a little more enjoyable. The other lead is Christina Kirk, who plays Jackie, Del’s crumbling personal assistant who also happens to be the office’s superhero fanatic, as evidenced by her muscle-covered cubicle. As far as super-characters, we’re confirmed to be getting introduced to the French hero Crimson Fox, as seen on the bottom of the photo here. 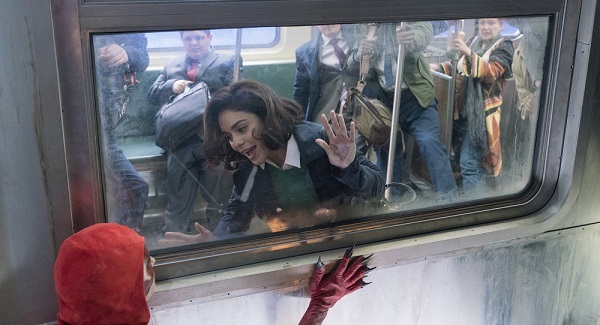 NBC has not announced how many episodes Season 1 of Powerless will get, according to THR, but I expect to receive quite a bit of support. It’ll certainly be one of NBC’s more buzzworthy shows going into premiere season, as this is DC’s first half-hour comedy since the original Batman series, although the comic giant wasn’t one of the actual companies behind that classic series. It’ll also be NBC’s return to comic-tinged fare after dumping Constantine following its freshman season. Powerless will also be one of either seven or eight DC Comics series on the air in the 2016-2017 season, depending on what happens with Supergirl. And it easily stands out in that crowd. Developed by A to Z creator and Cars 2 co-writer Ben Queen, Powerless is the first of the three in-development comic comedies to get an official series order. No word yet on what will happen to Marvel’s Damage Control or the other untitled Marvel project. All things told, though, it’s a fantastic time to be a comic-loving couch potato. Alan Tudyk? Can't wait!